Hindringham Hall at Hindringham Hall Gardens & Tea Room01328 878226workHistoric HouseThe moat dates form 1200 and is one of only a handful of complete moats in Norfolk. It originally enclosed a number of wooden medieval buildings and a community working for the Prior of Norwich to produce fish from the adjacent fish ponds. The outlines of the medieval fish ponds can still be seen. The moat still contains carp and eels. The moat is crossed by a brick and stone bridge to the south and a wooden bridge to the north. In the 18th century there was an earth causeway instead of the wooden bridge and the tunnel which had been under the earth to permit the free flow of water can still be seen. The moat is mainly revetted on the inner walls and partially revetted on the outer walls. It has a natural white clay base and is mainly fed by springs, but a system of sluice gates in the south east corner permits the topping up of the moat from the river Stiffkey in hot weather. The south east wing dates from the 15th century (Henry VII) and the remainder is Elizabethan (16th century). 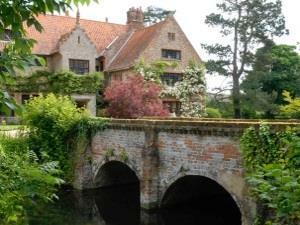 It is virtually unchanged from when it was enlarged by Martin Hastings in 1562. It remained in the ownership of the Church until 1880 being let on long leases together with many acres comprising the manor to gentlemen farmers. By 1880 it was virtually derelict due to the slump in farming and in multiple occupations by farm labourers. It was then acquired by Gerard Gosselin whose arms appear above the 15th century front door. Gerard Gosselin repaired the house over a period of 15 years and his widow lived there until 1947. The outlines of external projecting medieval garderobes can still be seen at first floor level at the back of the house. The entrance porch is built from stone taken from Binham Abbey after its dissolution by Henry VIII. The rest of the construction is of medieval brick and flint. The stepped gables show the Flemish influence. The moat dates form 1200 and is one of only a handful of complete moats in Norfolk. It originally enclosed a number of wooden medieval buildings and a community working for the Prior of Norwich to produce fish from the adjacent fish ponds. The outlines of the medieval fish ponds can still be seen. The moat still contains carp and eels. The moat is crossed by a brick and stone bridge to the south and a wooden bridge to the north. In the 18th century there was an earth causeway instead of the wooden bridge and the tunnel which had been under the earth to permit the free flow of water can still be seen. The moat is mainly revetted on the inner walls and partially revetted on the outer walls. It has a natural white clay base and is mainly fed by springs, but a system of sluice gates in the south east corner permits the topping up of the moat from the river Stiffkey in hot weather. A guided tour of the house and its history is available to parties of 20 or more by prior arrangement.